Everybody is staying up late tonight as the nation’s first Independence Day Parade starts in Gatlinburg at the stroke of midnight. 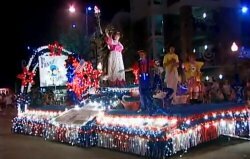 Since 1976 Gatlinburg has led the nation’s Independence Day celebrations, and tonight’s 37th Annual Gatlinburg Fourth of July Midnight Parade is no exception. The parade this year is slated to be one of the most patriotic and colorful ever in Gatlinburg, with over 100 floats, multiple balloons, and units of the Army, Navy, Marines, Air Force, and Coast Guard, plus vintage military vehicles. The event will also honor American heroes. Around 100,000 spectators are expected to watch the parade tonight, and thousands of folding chairs have been appearing along the route since early this morning. The parade will be led by the 100th Army Band from Fort Knox, Kentucky. Sectional groups from the band will also perform several concerts for different musical tastes during the day tomorrow at Ripley’s Aquarium of the Smokies, all free admission. The full band will again perform a concert leading into the fireworks display tomorrow night. Activities during the day include the always popular River Raft Regatta which starts at noon, sending a variety of unmanned floating objects down the river, with prizes awarded in several different categories. If you’ve managed to catch a nap somewhere along the line you’ll wake up again in the evening for the Fireworks Finale at 10 pm, a spectacular display visible from the streets of downtown Gatlinburg. Here’s a clip of a previous Parade to give you a taste of what’s to come!